Wears Alexa: Happy New Year's! Party look! Hi everyone! So today is New Years and the start of 2017! I'm so excited to see where 2017 takes me. I'm starting off 2017 with my first blog post. Todays Post is my New Years Eve party look. I'm, wearing this super fun yet edgy look tonight. My top is from the brand Japna, but I purchased it at Marshall's. 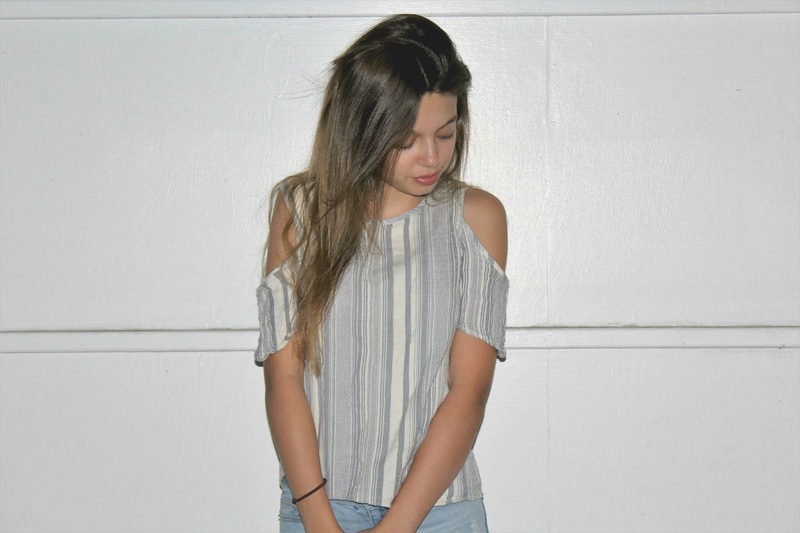 This top is white with blue colored stripes. It's also a cold shoulder top, which is my favorite part. This top is so diverse and you can style it so many different ways. I styled it with these light blue ripped jeans, which I purchased at Levis. These jeans are so edgy and they really tie in the whole look. To complete the look, I am wearing these super cute booties from Jessica Simpson but I purchased them at Macy's. These booties are a light brown color with this cool strings on the back. My Jessica Simpson shoes really dress the whole look up. I decided to keep my hair straight and simple. This look is great for a party, or if you just want to have fun! You can totally dress it up with jewelry or a fun lip color. Or you can dress it down with some sneakers. This look is so cool and anybody can wear it. I really hope you guys liked todays look! Love those jeans. Super fashionable. Thank you! BTW I love your fashion!